Bio: Sarah is a passionate violinist who loves to share her love of music with those around her. Trained extensively in both classical and country styles, Sarah has spent 11 years of her life living out a musical career. Some highlights of her career include: performing as a member of the SCSBOA (Southern California School Band and Orchestra Association) High School Honors Orchestra in 2016, performing at Carnegie Hall with West Coast Classical Concert and Symphonic Orchestras in 2015, and performing at Disney Hall with Idyllwild Arts High School Chamber Fest in 2015. In 2016, Sarah was awarded a Command Performance for her performance for the SCSBOA Solo & Ensemble Festival. Also, in 2016, she was awarded First Class Honors upon completion of the Level 10 Practical Examination for Royal Conservatory of Music. In 2014, she was awarded 1st Place in the Topanga Banjo Fiddle Contest & Folk Festival for Intermediate Fiddle. 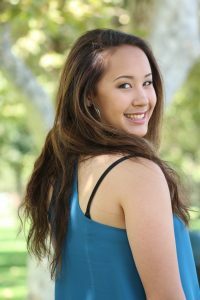 In 2013, she was awarded 1st place for her performance in the Antelope Valley College Bach Competition. Sarah is currently on the Junior Board for a non-profit organization, West Coast Classical, where she also performs under executive director and conductor, Patricia Graham. She also teaches a beginning strings class for West Coast Classical. Sarah has played in pit orchestras for several musicals including: Stuart Little, Oklahoma, Les Miserables, Once Upon a Mattress, and Anything Goes. She also has played for numerous weddings and events. Her teaching career began just 4 years ago; and since then, Sarah has found great joy in sharing the knowledge of music and the violin with her students. She absolutely enjoys seeing each one of them develop as a musician; and she, in turn, grows and develops as a musician as well. Sarah is in her second semester as an undergrad at Antelope Valley College with the intent to transfer to California State University, Northridge, where she intends to obtain her Bachelor of Music in Commercial & Media Composition. ● 30 minute or 1 hour lessons should be scheduled no less than once a week, throughout the school season and summer; additional lessons may be scheduled if time allows, but generally once a week is the appropriate frequency. ● Students who cancel ​WITHOUT​ 24 hours advance notice ​WILL BE CHARGED​ for that lesson, with the exception of an emergency or sickness. ● Lessons cancelled with 24 hours advance notice will be rescheduled if schedule permits. ● No refunds will be given for tardiness. ● Please try to abstain from cancelling regularly as that only succeeds in slowing the student’sprogress, promotes backsliding, and causes unnecessary frustration. ● Payments are to be remitted on a lesson by lesson basis, or by a monthly payment plan. ● Payments are accepted via cash or check. ● Please make checks payable to SARAH BUNCH. ● An additional fee of $3o will be charged if check cannot be cleared. ● Students should come to their lessons with materials (homework) prepared. ● Students are responsible to make room in their schedule for practicing their instrument daily.Remember–you get whatever you put into it, so if you wish to succeed, you must put in the effort! ● Students should be picked up no later than ​15 minutes​ upon conclusion of lesson unless previously arranged, or in the case of an emergency. If I am unavailable at the time you call, please leave me a message and I will do my best to reply within 24 hours.